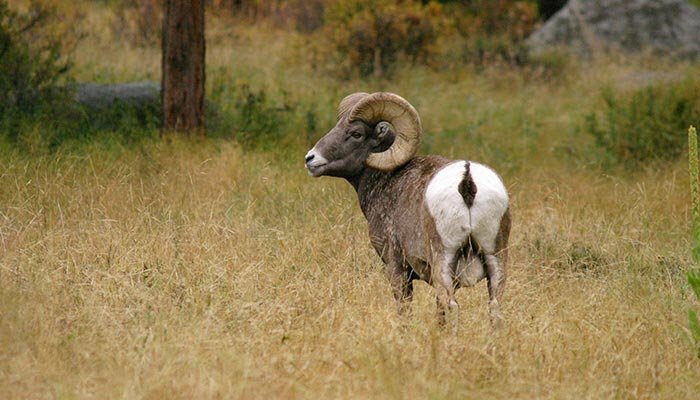 Bighorn sheep have chosen the slopes of McGregor Mountain Lodge as one of their favorite habitats. Professional photographers familiar with our local wildlife come to McGregor to shoot bighorn, so “our bighorn” are often featured on postcards, calendars and posters. To protect the sheep, we have a strict pet policy and we ask our guests to not approach them when they come wandering among the cottages. Our only fatalities have been the picnic tables that the bighorn used for butting practice. Bighorn visit the lodge year round but are most frequently seen from late October to April. 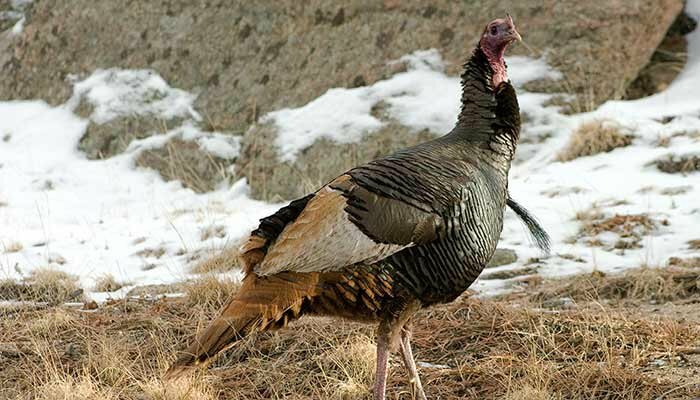 The fall rut brings head-butting contests October through early December. Ewes and rams particularly like our sunny south-facing mountainside in the winter and occasionally the ewes bring their new lambs in May and June. While bighorn are the stars of our wildlife show, we also feature elk and deer, fox, squirrels and hummingbirds in season. Rarely seen visitors have included mountain lion, bear, marmot and bobcat. Bird feeders and bird houses dot the Lodge grounds along the border of Rocky Mountain National Park. 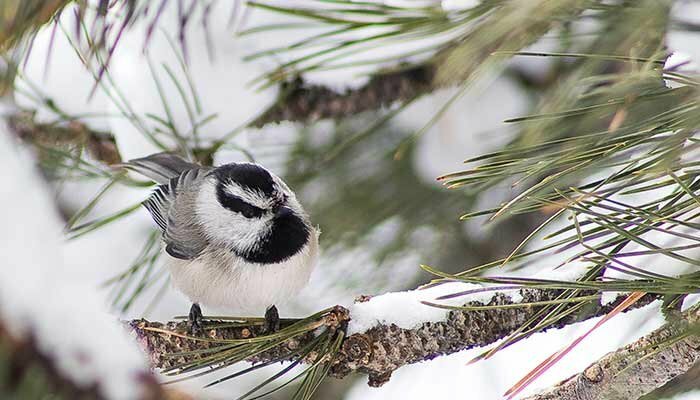 Year round, a lively chorus of birdsong starts each day. We are particularly known for our abundant Hummingbirds in the summer. There is a feeder at each cottage or suite and we make daily rounds to keep them filled. On winter days when the tundra up Fall River Canyon is especially cold or windy, our normal montane birds are joined by flocks of House Finches. Winters are also the time when the Grosbeaks make their regular visits to our feeders. The bird migration in spring brings surprise visitors to our feeders and there is nothing as exhilarating as the sound of the first hummer in May. Thanks to Bob & Nancy Bierling & Bill Bossman for providing this list! If you have been a guest at McGregor Mountain Lodge, and have some species to add to this list, please contact us. At McGregor Mountain Lodge, you are literally surrounded by endless world class climbing. Whether you’re in to Rock Climbing, Ice Climbing, Mountaineering, or skiing, you will be in the heart of it all. With Lumpy Ridge and McGregor Slab only minutes away, and the entrance to the National Park only 1/2 mile from our driveway, access is easy to some of the states most spectacular climbing. No matter what your skill level or what type of climbing you enjoy, the Estes Valley and Rocky Mountain National Park have you covered. If you want to hone your skills, head to one of the rock gyms in town. If you’d like some lessons on rock climbing, let us know and we can get you set up with some world renowned outfitters and instructors/guides. There are numerous alpine rock routes, mountaineering routes and big wall climbs in the park, access to all only minutes from the front door of your cabin here at McGregor. Come in the winter to try your hand at ice climbing or come in the spring months when the weather is warming and the snow climbs are in pristine condition. The bottom line is that we here at McGregor are passionate about our beautiful and wild surroundings and we offer a great place to access some of the world’s most beautiful landscapes and offer that perfect place to unwind and relax after a long day in the hills. For the outdoor enthusiast and adventurer, consider hiring our local professionally certified guide, Mike Lewis. Mike has been guiding for more than 20 years in the U.S. and internationally. 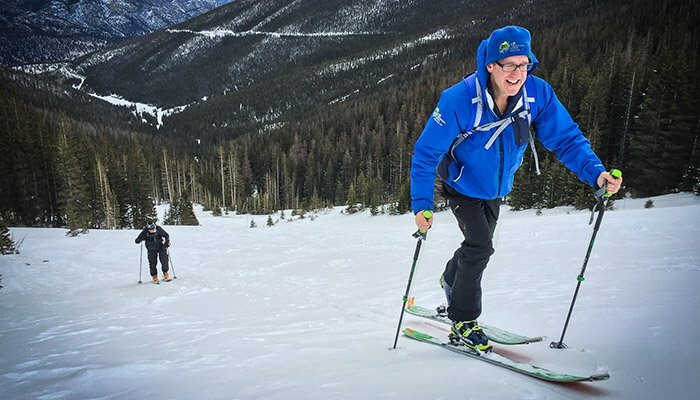 Whether an expert in climbing or back country skiing, or just beginning Mike will be glad to show you all the magic that Rocky Mountain National Park and the surrounding areas offer. From Ice climbing and skiing in the winter and spring months, to climbing Longs Peak or Lumpy Ridge or exploring the McGregor Slab (literally out your back door) or the Flatirons in Boulder, Mike has the experience to make your outing personable and memorable for one, two and three day guiding adventures. Learn more about Mike at www.LunchboxJackson.com and get in touch with him at mettafriend@gmail.com or 720-454-8698. 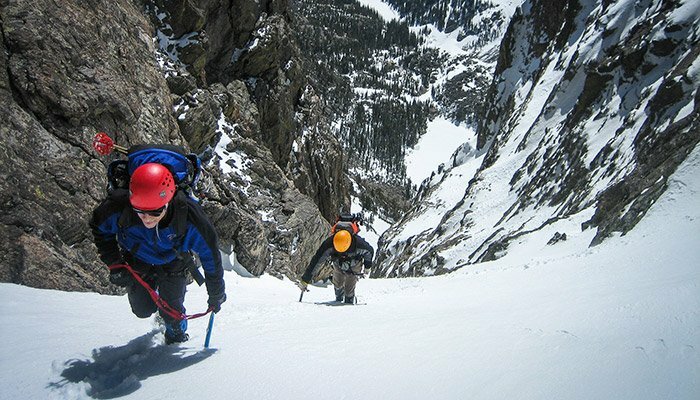 If Mike isn't available, or simply as another resource, please contact the good folks over at the Colorado Mountain School! 800-836-4008 x3 They have loads of massively experienced guides that can cater to any experience level and give you the tools to tackle any terrain! Tanner, and Bently have been raised here at the Lodge. They are trained on how to act or NOT react to the abundant native wildlife on the property. Their presence out and about the cabins is perfectly acceptable as long as they are not being bothersome to you. Please note that they are welcome, and feel at home, in your cabin as long as it is approved by you. 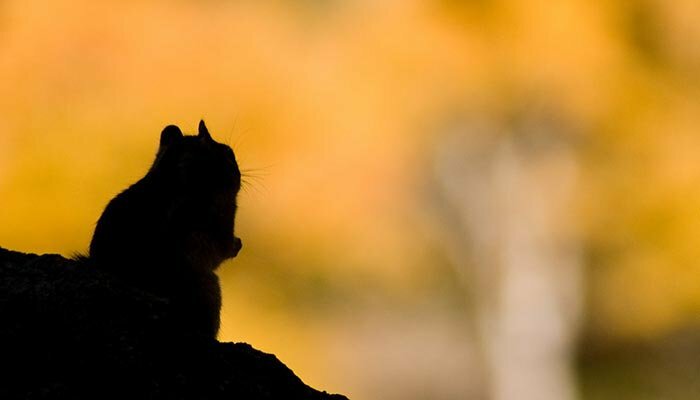 Open doors invite them in, along with other critters such as Chipmunks! By keeping the doors closed, or by telling them to "go home,” they will respond to your request and realize they are unwanted around your cottage. We ask that you DO NOT feed Tanner and Bently, no matter how pathetic their “puppy dog eyes” may seem to be. Studies have shown that excessive people food and/or table scraps may shorten a dog’s life by up to five years. If you do feel the need to award them with treats, they are allowed Milk-Bones, and other LOW-FAT doggie treats you can find at your pet store. Their favorite treats are Scoobie Snacks! Please no rawhide or other treated bones. We have 19 units on property. Please only feed them 1 or 2 small treats. Try multiplying their DTI (Daily Treat Intake) by 19!! 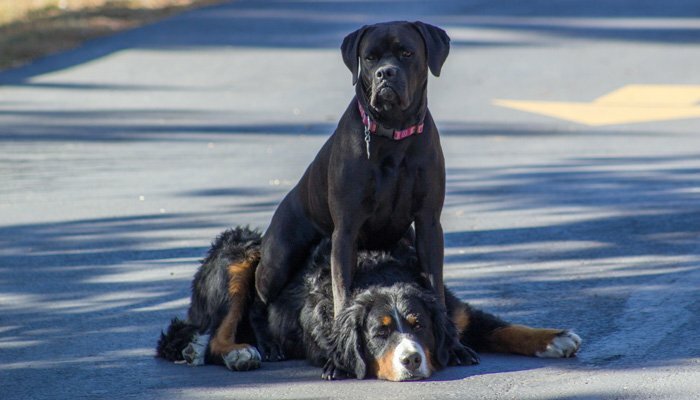 These dogs are very loving and enjoy spending time with their guests. They are wonderful around children, and are often the highlight of the family vacation. 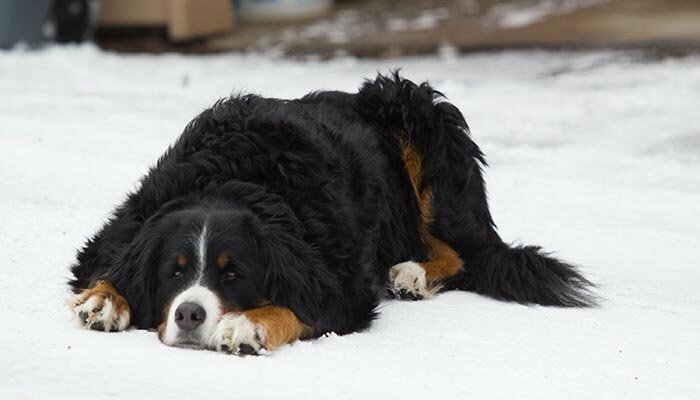 Tanner is a Bernese Mountain Dog and was born in November of 2007. He is now a tried and true McGregor veteran, having learned the ropes from Daisy, a beloved former mascot here at the lodge. Bently is the newest addition to our pack! He is a Shih Tzu and a very lovable little guy. He isn’t here quite as much as he technically belongs to Claire, owner Chris Wood’s daughter. So he is up at the lodge when Claire says it’s okay! If you’re wondering about Trevor and Daisy, these two were the original McGregor mascots and truly loved by everyone that came to know them. They are both dearly missed and hold a special place in McGregor’s history and in all of our hearts! From your cabin door at McGregor Mountain Lodge, you can venture up the slopes into Rocky Mountain National Park. A path leads up through sloping meadows where herds of Bighorn Sheep, among other wildlife, like to gather. Once you hike a few hundred yards, there are many game trails and rock outcroppings that make for great exploratory hikes. If you become overly ambitious, you can work your way through the very steep, rocky terrain to the summit of McGregor Mountain (10,486 ft). 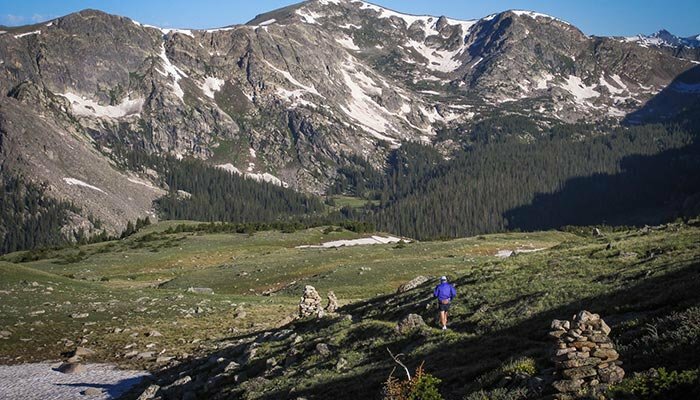 A short hike across Fall River Road brings you to Aspenglen in Rocky Mountain National Park. From there, trails lead throughout the Park. In the old days, people hiked from their door all the way over the Continental Divide to Grand Lake! Even though there is scenic hiking from your cabin door, you will most likely want to hop in the car for a short drive to the official trailheads in Rocky Mountain National Park. 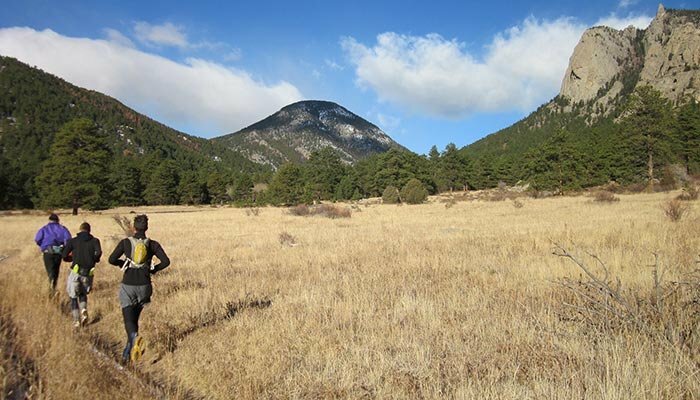 The closest trailheads to McGregor Mountain Lodge are the “Lawn Lake Trailhead” and the “Deer Mountain Trailhead.” These are only five minutes away by car. 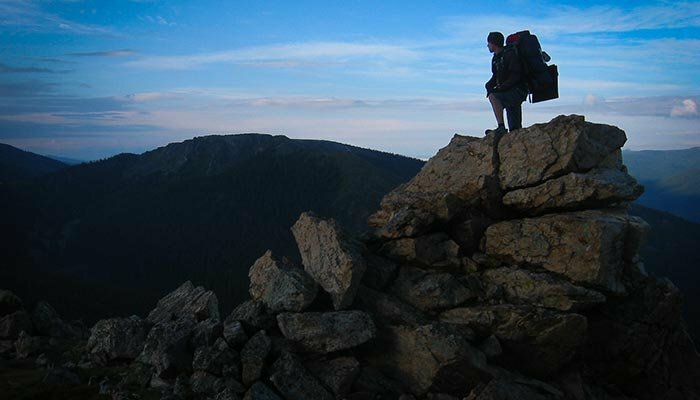 These trailheads take you to wonderful mountain summits. The Lawn Lake trail will follow the Roaring River all the way to Lawn Lake. Many more trailheads are within minutes from McGregor Mountain Lodge, including the Glacier Gorge Trailhead and the Bear Lake area. The Longs Peak Trail and Wild Basin are both only a short scenic drive away, down the Peak to Peak Highway (Hwy 7). McGregor Mountain Lodge is in the center of a runners paradise! Stunning roads wind through our high valleys and world class trail running is only steps out you cabin door! We often get asked where some good runs are from here at the lodge and in the immediate area. We hope this page will give a little insight into some options for you either from your cabin or a short drive away. Happy Trails! You do need a National Park Pass to be on trails within the National Park. On any run leaving and/or ending at McGregor Mountain Lodge, you will have to run some distance (+/- 1 mile usually, but sometimes more) along HWY 34, aka Fall River Road. Use extreme caution as you run along this highway. 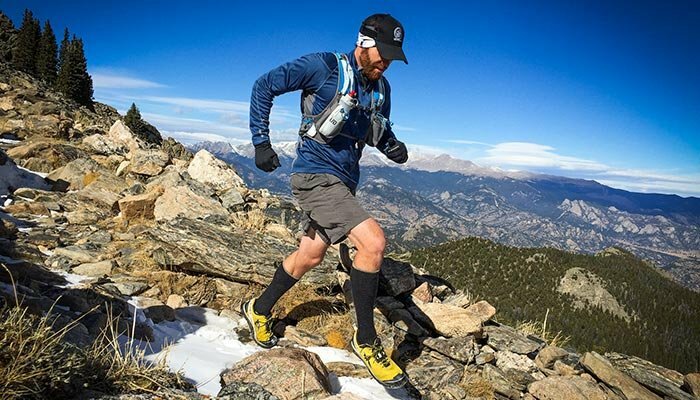 There are inherent dangers while running or trail running in the mountains. Please know the risks and take appropriate precautions. On trail runs, it is very smart to not run alone. Try to run with someone else and always let others know where you are going. You can email us at info@McGregorMountainLodge.com with details of where you’re going and when you intend to return, if you have no one else to tell. rail conditions constantly change (weather, downed trees, washed out trails, etc). Use our maps only as a reference and know you may have to retrace your steps if a trail is too dangerous to pass or impassable for any other reason. While there is no rafting in the immediate Estes Park area, there is great rafting very close by. 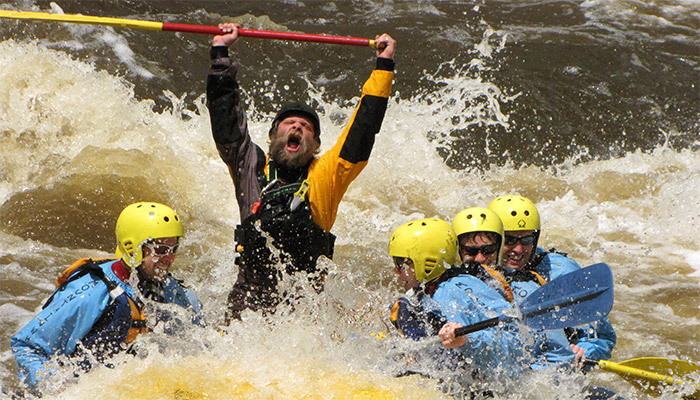 Rafting the Cache la Poudre River, outside of Ft. Collins, is a blast and will be a thrill no matter your skill level. 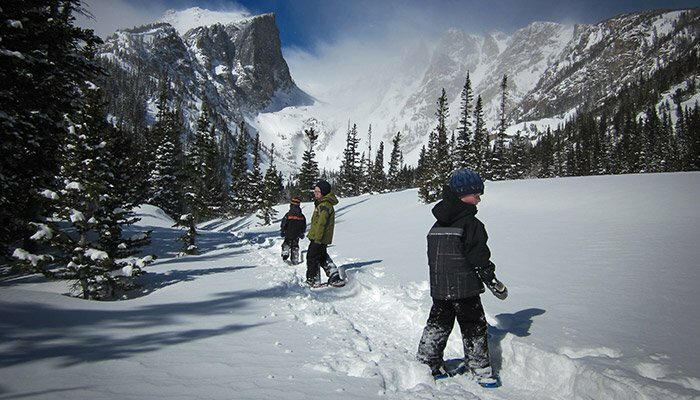 Winter months in Estes Park and Rocky Mountain National Park offer so many options to enjoy some of the best snowshoeing in the country! There are virtually endless miles of trail that lead to truly spectacular places. You can take it easy and snowshoe around Sprague Lake or Bear Lake, or you can head for the higher terrain, such as Sky Pond or Flattop Mountain. Either way, you will be in for a real treat! There is nothing like being in the park when there is fresh powder, the snow is falling and you’re breaking trail to one of your favorite destinations. The peacefulness of being in the wilderness on a beautiful winter day is unmatched. It’s something one must experience for themselves. Are you a beginner? No problem! If you can walk, you can snowshoe. You just need a good pair of waterproof boots, some moisture wicking socks (such as Smartwool) and the right clothing (no cotton). You’ll also want sunglasses and sunscreen. Ask us about snowshoe rentals and recommendations for some great trails! Back Country skiing outside of Estes Park is truly world class! Whether you're cruising up the old ski area at Hidden Valley or getting deeper into the back country in Tyndall Gorge the skiing here is hard to beat! If it's a bit intimidating to you but you still want to give it a go, just let us know and we can hook you up with incredible guiding services that will cater to your ability and show you how peaceful and freeing skiing in RMNP can truly be!